Oliver, BC (September 15, 2015) – Tinhorn Creek Vineyards is thrilled to announce their new charity, Celebrate the Arts, which funds fine arts programs for children in the local Oliver area. 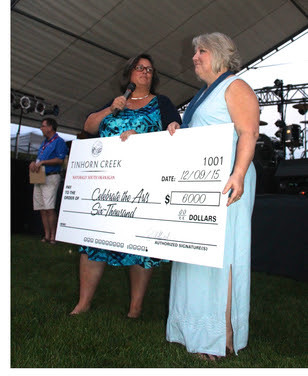 This weekend, a $6000 cheque was presented to Lori Martine from Oliver Elementary School (pictured right) at the grand finale of the Tinhorn Creek Vineyards’ Canadian Concert Series. The money will go to local schools including Oliver Elementary School, Tuc El Nuit Elementary School and South Okanagan Secondary School to fund extra music, drama, dance and fine arts programming for students. Tinhorn Creek Vineyards hopes that the extra funding will pay for the expansion of current music programs to include repair and maintenance for instruments, the expansion of the drama offerings with more theatre rental time, and the ability to bring in more dance and acting performers in school assemblies and more artists into the classrooms. Tinhorn Creek Vineyards will also be making in-kind donations such as the use of their outdoor amphitheatre, tasting room and barrel cellar for performances and rehearsals; use of the guest suite for visiting performers and encouraging students to perform at winery events. A portion of proceeds from the Tinhorn Creek Canadian Concert Series next season will go to Celebrate the Arts, as well as a portion of Tinhorn Creek’s annual income.